You know, I can't even remember the last time that I went out to a Wal-Mart or a Target to get something that wasn't a Transformer. This was the first in a very long time. 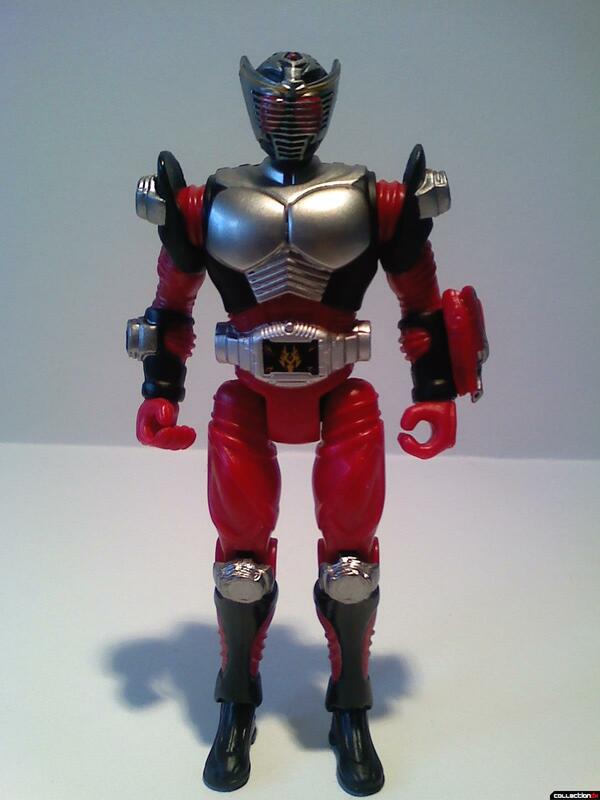 This is the action figure of Kamen Rider Dragon Knight from the 2009 show Kamen Rider Dragon Knight. 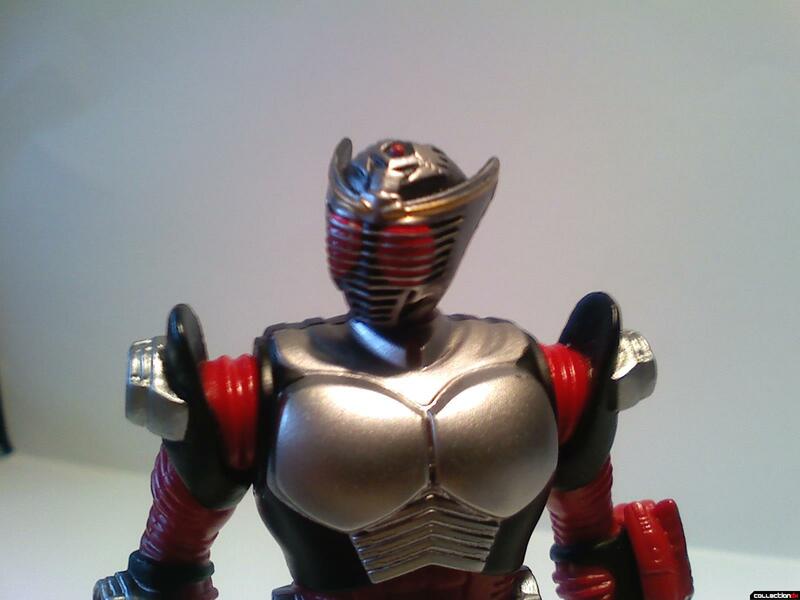 Dragon Knight is the American remake of the 2002 series, Kamen Rider Ryuki. I haven't seen it myself but I've heard it's pretty good. This is the titular character known as Kamen Rider Dragon Knight. He's a 4 inch tall action figure from Bandai. He's pretty basic, like any other action figure really. One thing that I noticed however were his proportions. It definitely has a rather "Americanized" feel to it. His chest is very broad and well built in comparison to the show model, along with a rather tiny looking head. Paint and details are all pretty good. Since Dragon Knight's eyes are behind the visor he wears, it's very hard to capture this look in a toy. However Bandai managed to do it pretty well without the eyes being too bulbous. The paint apps are all clean and even the belt's details are all nicely done. The Dragvisor feels a little small, but at this scale action figure it doesn't seem to be too big of a deal. Articulation is... less than great. The arms are on swivel joints, as are the legs. The head rests on a ball joint and the wrists swivel as well. There is no elbow articulation, no waist joint, and no foot swivel either. Despite that, he poses pretty well. 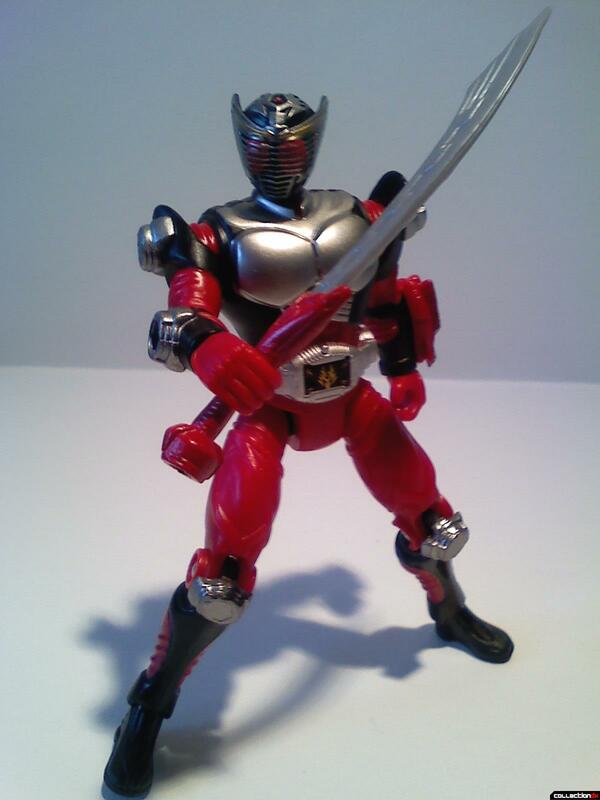 Dragon Knight is a pretty stable figure and will stand in most positions you put him into. The arms are limited because I think Bandai wanted to incorporate the use of these actions figures for the Advent Cycle. The angle and arc of the arms matches those of the handles, and the holes on the side of the belt are the same ones used to hold figures in place while in the Advent Cycle. 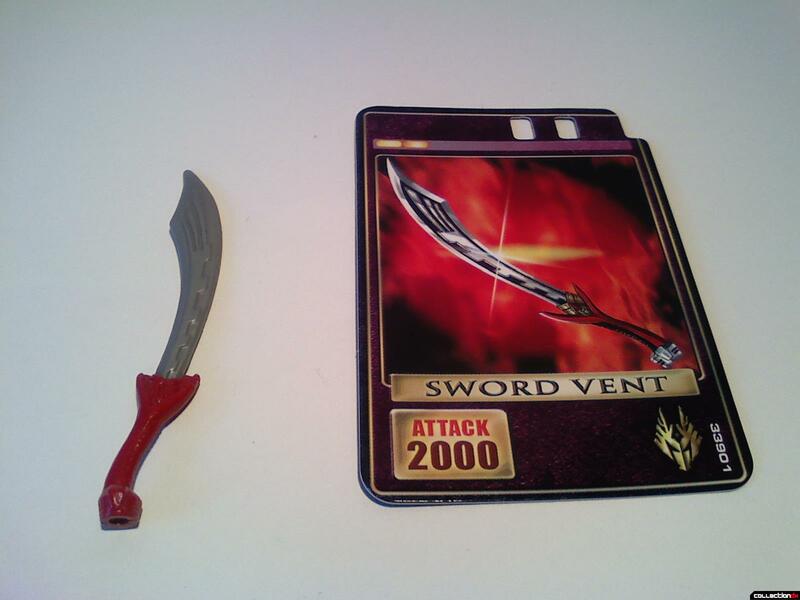 Dragon Knight comes with a single weapon, his signature sword, along with the Sword Vent card that can be used with the Dragvisor toy. It's a floppy piece of PVC that came bent with my Dragon Knight. It fits snuggly in either hand. Dragon Knight isn't a bad toy, he just feels a little lacking, especially in articulation. To me it's unfortunate that a Kamen Rider action figure doesn't even have the articulation to properly do a rider kick. Despite that, he does have a good bit of shelf presence and is sculpted very well. If you really like the Kamen Rider characters, I think they're worth picking up. ...except that there is nothing on the Advent Cycle (which I covered for CDX, BTW) to hook onto this or any other figure! So, all the sockets you see on this- or any other BA "KR:DK" figure- are useless and just for show. And, yes, articulation is noticeably lacking on the 3.5" line. Good review. 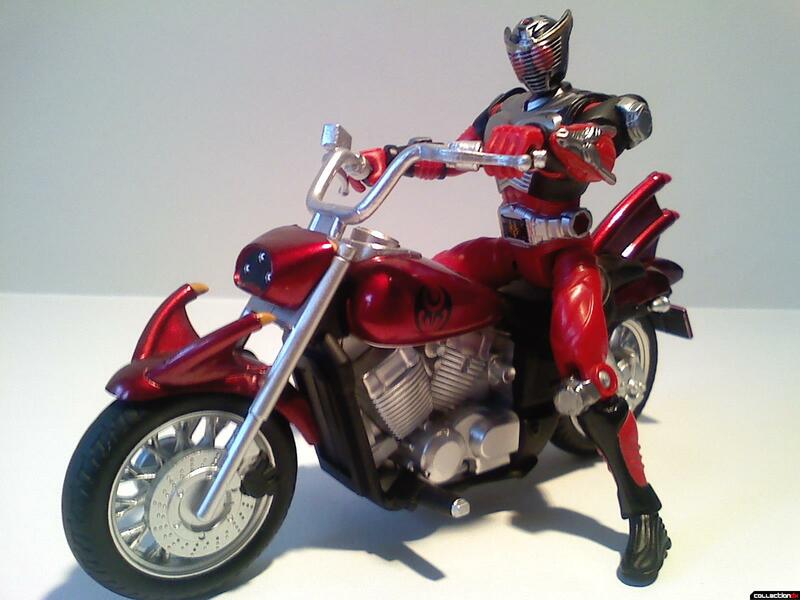 (I LOL'd when I saw him riding Kiva's bike.) And I'm right there with ya- rarely to I go to a TRU (when I have money to spend) and not get a transformer or a Lego set; I'm just not a figure collector. The whole line is a sad, weak effort by Bandai (of America). Shame. Yeah, it is pretty weak. A lot of it is based on the 3" figures, and those are the big fail point. XD Nice use of my Kiva bike. XD Nice use of my Kiva bike. Concurrence (that a word?) on everyone's points, it's really too bad, especially for what you paid for him. If I remember correctly it was much more than you should've been paying. This show is cancelled. They're not even going to air all the episodes they made. They should have just dubbed Ryuki,then they could have at least made some money back from DVD sales to adult KR fans. I took a look at these figures at TRU the other day,but I just couldn't bring myself to spend the money on one-every negative point in this review is spot on. BTW this was only 2 weeks before Christmas,and the pegs were PACKED with these guys.